Facebook Messenger Day is the newest Snapchat clone Mark Zuckerberg has added to the messenger app. This Snapchat’s Stories-like feature was first released into WhatsApp and Instagram and now, the social network says the feature is rolling out to users worldwide, on both Android and iOS. 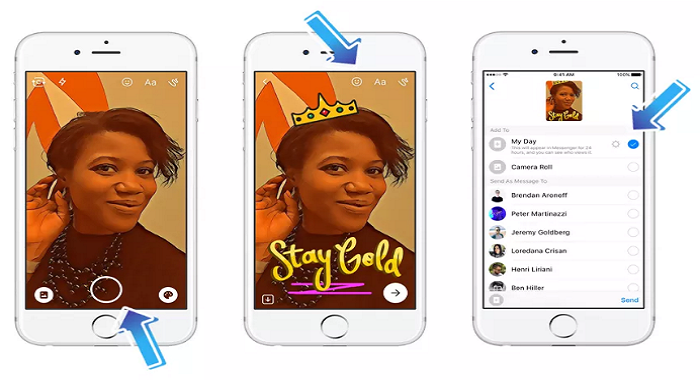 The new feature “Messenger Day” allows you to use Messenger’s built-in camera to snap pictures or videos; add text, doodles, cartoon overlays, or facial filters; and then drop this content into a little digital bundle (your “Day”) that all or some of your friends can access, and that deletes itself every 24 hours. To spice things up, the social media giant decided to increase the video recording limit. Although the extra 5 sec added to Facebook Messenger’s Day might seem too small but with that little time, you can do some other things like cracking more jokes and sending more information to the people you choose to share it with. According to Facebook, it has begun rolling out the Messenger Day globally to all messenger users. To activate, simply visit Google play store and update your messenger app. But if the update is not available to you yet, no need to freak out. Facebook likes to ensure everything is running smoothly as more people begin using new features, it may take some time before you get it. However, when a shutter button with yellow and blue color at the bottom of the app turns into a sun, then you have successfully activated the Day feature. Tap on the camera icon that will enable you to take pictures and video then you can tap on the photo icon to upload the pictures taken. If you want to add text to the image click on the pallet icon then you can add your text.By tapping the small icon at the small button left of the screen, you can choose to upload pictures from your galleries. After choosing the pictures you want to share, you will need to add effects to them to do this, click on the smiley face icon to add stickers which are subdivided into two filters Dress Up which enables you to add sticker like face cap to the pictures you choose to add effect to and Who’s Up For” click on the squiggly line icon to write on the post. With all that accomplished you can now share your day by tapping on the arrow that will show up right at the bottom of the screen to select who is to view your post. By default, everyone can view your day. But it has the option for you to determine who can or can’t get a view. All you need do is tap on the More icon, followed by Everyone Except or Custom. After Day is active for your account, each time you open Messenger there’ll be a row of cards at the top of the screen. Each friend who’s using Day will have a card; tap on a card to view your friend’s day. Skip past a photo or video with a tap on the display, or leave your finger on the screen to pause playback. Tap on any of the text shortcuts along the bottom of your friends’ posts to quickly send a message, some of which include an emoji. Just like WhatsApp Stories, Messenger Day won’t reveal if you take a screenshot of a friend’s Day post. Not that Snapchat’s screenshot reporting tool should make you feel any safer about sharing potentially embarrassing photos.